Where does your baby sleep, with you or alone? While many new mothers prefer their babies to sleep with them, there are a few who like sleeping alone. Read on to know more about co-sleeping and its effects on children. Your bundle of joy is finally here. You are reading up magazines and asking elders on how to take care of your little one. 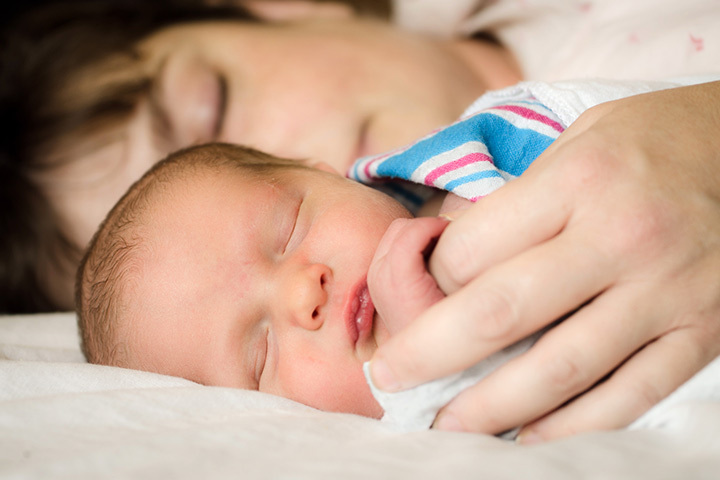 One question that most mothers have is – how to co-sleep with my baby? But before we get onto that, we must understand what is co-sleeping. Co-sleeping is sharing sleep environment with your baby. For some babies, sleeping alone can be tough. Babies like closeness and comfort. Some babies love the coziness of co-sleeping while others do not. Some of the positive aspects of co-sleeping are as follows. As a mother, you do not have to get out of your cozy bed to check on your baby. Breastfeeding becomes convenient. Your baby will just cuddle in when it’s time to drink milk. Going back to sleep after feeding your baby becomes easier. You can soothe your baby if he cries during the night. Working parents do not get the time to stay close to their babies. For them, co-sleeping is a way to bond with the newborn. Some babies sleep better with their parents. Co-sleeping should be a family decision. Make sure your partner is comfortable with your decision. Talk to each other about the issue. It is important that you consider each other’s consent before making such a plan. Co-sleeping can deprive you of sleep. Your infant will toss and turn. He may also burp while you try to get a good night’s sleep. If you baby sleeps with you, you may not be able to spend time with your partner. This will require you to take some extra time to plan something to spend time with him (your partner). Some experts are of the opinion that your baby may get used to co-sleeping with you. He may find it difficult to learn to sleep along when he grows up. 1. A baby crib next to the bed is a good option. 2. Dress your baby minimal to avoid suffocation. 3. Do not put your baby in an adult bed all alone. 4. Do not place your baby in a soft surface like couch or soft mattress. 5. Do not cover your baby’s head while sleeping. 6. Pillows, quilts and other soft items on the bed can be dangerous. It increases the risk of SID. 7. Do not drink alcohol or take any drugs. These may cause you to roll over on to your baby. It is needless to mention that it may lead him to suffocate. 8. Dress your baby in a sleeper. Do not use a blanket. 9. Do not sleep on couch, recliner or rocker with your baby. 10. Do not fall asleep with your baby on your chest. Remember, not every baby enjoys co-sleeping. If you find your baby restless or fussy at night, you can put him in his crib. He will stay happy there. You can watch over him from a distance. Crowding in the bed can lead to a space problem.